A-dec Dental Equipment Prices - FREE Upgrades for 2019! A-dec have just released these fantastic free upgrades for 2019 on their dental chair range. This world leading dental equipment manufacturer is promoting these a great choice of upgrades on its A-dec 500 and 500 three, 400, 300, 200 and Performer chair packages. Hague Dental are authorised dealers for the UK and would be delighted to provide you with some pricing and a full quotation, whether you are looking to just switch up your dental chair, if you are considering a surgery refurbishment or are perhaps looking a setting up a new practice in 2019. See the entire A-dec range at our showrooms near Gatwick. Appointments can include evenings and weekends. Fill the form on this page to take advantage of our ‘no obligation’ surgery design and equipment consultations. 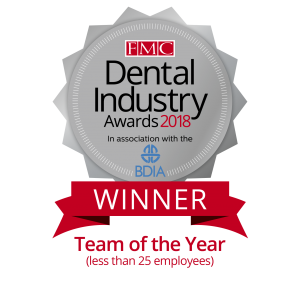 Let the BDIA/FMC ‘Team of the Year’ 2018 and ‘Customer Service Provider’ 2015, 2016, 2017 take care of you.